Background: Insertion of I-gel requires adequate depth of anesthesia and jaw relaxation in an unparalyzed patient. Propofol with adjuvants is commonly used to facilitate I-gel insertion. This study was conducted to compare ease of insertion by addition of either dexmedetomidine or butorphanol added to propofol for insertion of I-gel in gynecological laparoscopic surgeries. Materials and Methods: About 120 female patients, the American Society of Anesthesiologists (ASA) Grade I–II, 18–40 years, and body mass index (BMI) <30 kg/m2 were allocated randomly either to receive dexmedetomidine 0.5 mcg/kg IV (Group I) or butorphanol 0.02 mg/kg IV (Group II). Ease of insertion score was determined by jaw mobility grading, number of attempts, need of manipulation, limb movement and bucking, use of laryngoscope and muscle relaxant, and time taken for insertion. Adverse events like expiratory stridor, lacrimation, breath holding, and audible air leak after insertion were also noted. Intraoperative monitoring included heart rate (HR), mean arterial pressure (MAP), and oxygen saturation at 0–15 min of I-gel insertion. Post-operative side effects like coughing, laryngospasm, hiccups, and sedation were also noted. 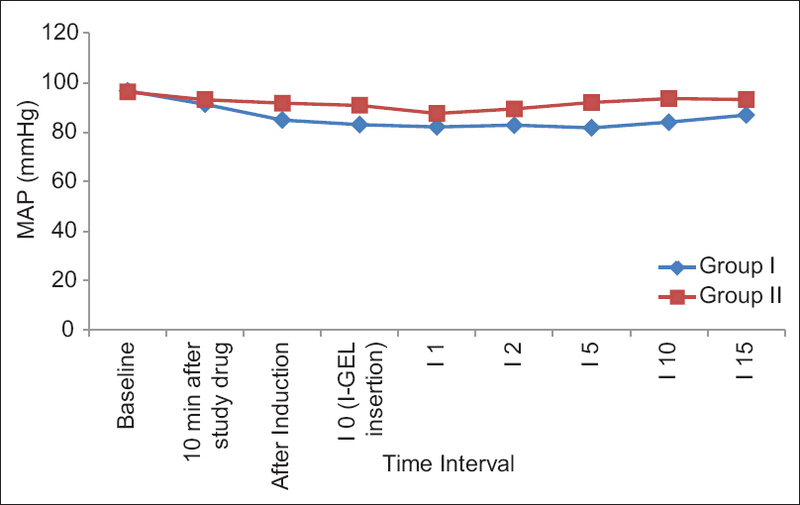 Results: The efficacy of successful insertion of I-gel was significantly higher in propofol-dexmedetomidine (Group I) as compared to propofol–butorphanol (Group II) (P < 0.001). Significant fall in HR from baseline to 15 min after I-gel insertion (88.65 ± 14.84 to 71.90 ± 12.15 bpm) was found in Group I as compared to Group II (87.60 ± 12.71 to 83.52 ± 10.91 bpm, P < 0.001). There was a fall in MAP from baseline values after induction upto 15 min following insertion in Group I (96.72 ± 13.54 to 86.96 ± 11.03), while in Group II fall in MAP from baseline was observed only upto 1 and 2 min of I-gel insertion (96.27 ± 9.53 to 89.42 ± 9.03) (P < 0.001). Conclusion: Addition of dexmedetomidine to propofol provided significantly better insertion characteristics for I-gel and adequate hemodynamic stability with minimal complications compared to butorphanol. Supraglottic airway devices (SAD) like I-gel have been introduced over the past decade to protect the airway in both elective as well as in emergency situations.,,, Relaxation of jaw muscles and suppression of upper airway reflexes such as coughing, gagging, and laryngospasm to provide sufficient depth of anesthesia is required for its insertion.,, This can be achieved either by intravenous or inhalational induction, but as the time required for attaining adequate depth is longer for inhalational agents, intravenous route of induction is generally preferred. Propofol provides rapid onset and offset and is commonly used as an induction agent for the insertion of SAD because it provides smooth induction and its depressant effect on airway reflexes allows easier insertion. However, when used as a sole anesthetic for successful insertion of SAD, larger doses are required which may lead to cardiovascular depression and prolonged apnea. Pain on injection and involuntary movements due to intravenous propofol provides less satisfactory conditions for SAD insertion. In order to decrease these adverse events, it is combined with opioids or neuromuscular blockade, but their use is associated with increased risk of pulmonary aspiration during insertion of I-gel in patients at risk. Opioids such as fentanyl is commonly used in combination with propofol and provides good SAD insertion conditions, but side effects like apnea, respiratory depression, and chest wall rigidity may occur. Dexmedetomidine is a specific and highly selective α2-adrenergic agonist that has sedative, sympatholytic, hypnotic, and analgesic activity without respiratory depression. It inhibits norepinephrine release and produces predictable dose-dependent reduction in arterial blood pressure (BP) and heart rate (HR), and also reduces the dose of propofol during induction and maintenance. On the other hand, butorphanol is an agonist-antagonist opioid having moderate affinity for Κ and μ receptors, being either antagonistic or partially agonistic without any respiratory depression property., Limited literature is available comparing dexmedetomidine and butorphanol as adjuvant to propofol for insertion of I-gel for gynecologic laparoscopic procedures. This study was aimed to compare the insertion characteristics of I-gel with propofol using adjuvants dexmedetomidine or butorphanol. Our primary objective was to assess the I-gel insertion characteristics, while secondary objectives were to evaluate the hemodynamic responses to I-gel insertion and record any adverse effects in both the groups. After approval from the Institutional Ethical Committee, this prospective, randomized study was carried out on 120 female patients, the American Society of Anesthesiologists (ASA) I and II, between 18–40 years of age, body mass index (BMI) <30 kg/m2, scheduled for diagnostic laparoscopic surgeries requiring general anesthesia. The exclusion criteria included patients at high risk of aspiration (full stomach, history of gastroesophageal reflex disease, hiatus hernia), patients having known hypersensitivity to the study drugs, patients having restricted mouth opening and Mallampati grading 4, BMI >30 kg/m2, and patients with cervical spine disease. Following detailed pre-anesthetic evaluation and written informed consent, patients were randomly assigned using a computerized randomization tables into two groups of 60 patients each. Monitoring in the operation theatre included pulse oximeter, non-invasive BP, and electrocardiography. All patients were premedicated with IV glycopyrrolate 5 mcg/kg, ondansetron 0.15 mg/kg. Group I received dexmedetomidine 0.5 mcg/kg IV and Group II received butorphanol 0.02 mg/kg IV. Both drugs were diluted to 10 ml with 0.9% normal saline. Patients were preoxygenated with 100% oxygen for 3 min and study drugs were administered followed by induction with IV propofol. 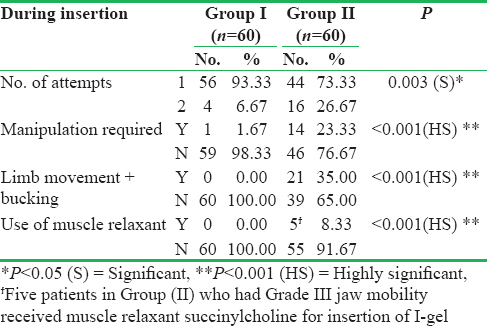 After 90 s of propofol induction, assessment of jaw mobility was done before I-gel insertion according to the following grades: Grade: I – fully relaxed; Grade: II – mild resistance; Grade III – tight but open; Grade IV – closed. Once an adequate depth of anesthesia was achieved, judged by loss of verbal contact, jaw relaxation, and absence of movement on jaw thrust, the I-gel was inserted with the standard routine technique without use of muscle relaxant. The size of I-gel chosen was based on patients body weight and manufacturer's recommendations. After insertion, I-gel was fixed and correct placement was confirmed by bilateral symmetrical chest expansion on manual ventilation, breath sounds on auscultation, square waveform on capnography, no audible leak of the gases, and no gastric insufflation. Jaw mobility grading and insertion of I-gel was done by a qualified anesthesiologist with minimum 2 years' experience who was blinded to the study drugs administered to the patients. Additional bolus doses of propofol (0.5 mg/kg) was administered if there was resistance to mouth opening, gross purposeful movement or coughing, and straining during I-gel insertion. If the I-gel failed to negotiate or significant audible leak was present or inadequate ventilation with EtCO2 >45 mmHg following insertion of the device, then the I-gel was removed. An additional bolus dose of propofol 0.5 mg/kg was given and if jaw mobility grades persisted as III or IV, then IV suxamethonium 0.5 mg/kg was given along with 100% oxygen by bag mask ventilation. Insertion was reattempted at 30 s interval and manipulation was done in the form of increasing depth of insertion, jaw thrust or chin lift, or changing the size of the device. Attempts were considered unsuccessful, only if the device was negotiated beyond the oropharynx and ventilation was inadequate. The device insertion was abandoned after three unsuccessful attempts and these patients were given a further dose of muscle relaxant and trachea was intubated using conventional rigid laryngoscopy with appropriate size endotracheal tube and were excluded from the study. Insertion time was defined as time from end of the propofol bolus to connection of the airway to the breathing circuit. Ease of insertion score was determined by the same anesthesiologist using jaw mobility grading (Grade I–IV), number of attempts, need of manipulation, limb movement and bucking, use of laryngoscope and muscle relaxant, and time taken for insertion. Adverse events like expiratory stridor, lacrimation, breath holding, and audible air leak after insertion were also noted. Anesthesia was maintained with oxygen, sevoflurane (2-2.5 MAC), and controlled ventilation in case of neuromuscular blockade. Intraoperative monitoring included HR, BP, mean arterial pressure (MAP), percentage saturation of oxygen (SpO2), and end-tidal CO2 (EtCO2) which were recorded at 0, 1, 2, 5, 10, 15 min of I-gel insertion (I0,I1,I2,I5,I10,I15) and immediately after removal of the device. I-gel airway removal was undertaken at the end of surgery if the patients were conscious, obeying verbal commands with spontaneous eye opening. Side effects like coughing, laryngospasm, and hiccups were noted. All patients were shifted to post-anesthesia care unit and monitored for hemodynamic parameters and sedation according to the Ramsay Sedation Score (RSS) for 1 h. Patients were observed for a period of 24 h for any complaints of sore throat and hoarseness of voice. Sample size was calculated using power analysis to identify 60 patients per group, required to detect 30% difference between groups with a power of 80% and an α error of 0.05. Data were analyzed using the unpaired Student's t-test (z-test) for parametric data and non-parametric data were analyzed using the Chi-square test. Results were presented in the form of range, percentage, mean, and SD. P value of <0.05 was considered statistically significant. There were no statistically significant differences in the demographic characteristics and duration of insertion of I-gel (P > 0.05) [Table 1]. The efficacy of successful insertion was statistically significant with respect to various ease of insertion characteristics of I-gel insertion in Group I as compared to Group II [Table 2]. Group I showed successful insertion in the first attempt in 56 (93.33%) patients and second attempt in 4 (6.67%) patients as compared to Group II in which successful insertion in first attempt was seen in 44 (73.33%) patients and second attempt in 16 (26.67%) patients. The difference in successful insertion in first and second attempt between the two groups were statistically significant (P = 0.003). Similarly, mean time taken for I-gel insertion was 19.2 ± 5 s in Group I, while in Group II, mean time taken for I-gel insertion was 25.7 ± 6.8 s, which was statistically highly significant (P < 0.001). Comparing grading of jaw mobility, it was observed that in Group I, 57 (95%) patients had jaw mobility Grade I on induction as compared to 15 (25%) patients in Group II, while Grade II was seen in 3 (5%) patients in Group I as compared to 40 (67%) patients in Group II which was statistically highly significant (P < 0.001). Grade III was seen only in 5 (8%) patients in Group II in which muscle relaxant was used for insertion of I-gel while none of the patients had Grade III in Group I. Ease of the insertion score was found to be highly significant statistically in Group I as compared to Group II (P < 0.001). [Table 3] thus shows more patients in Group I had Grade 1 scoring (n = 43) as compared to 32 patients of Group II who had Grade 2 scoring. There was no statistical significance between requirement of induction doses in both the groups (P = 0.110). However, number of patients requiring additional doses of propofol was highly significant statistically in Group II as compared to Group I (P < 0.001) [Table 4]. In both the groups, one patient each had respiratory stridor after insertion of I-gel while two patients had coughing in Group II which was statistically insignificant. Patients were well sedated at the RSS 3 (n = 29) and 4 scores (n = 31) in Group I as compared to RSS 1 (n = 55) and 2 (n = 5) in Group II patients. Statistically significant fall in HR [Figure 1] and MAP [Figure 2] from baseline values were observed following I-gel insertion in Group I as compared to Group II (P < 0.001). However, the decrease in MAP was within 20% of baseline values. Smooth insertion of I-gel requires adequate depth of anesthesia to suppress the airway reflexes and relaxation of jaw muscles. In our study we administered either dexmedetomidine or butorphanol with propofol to compare insertion characteristics, hemodynamic responses, and adverse effects during insertion of I-gel. The ease of insertion of I-gel was assessed based on various parameters as the number of attempts required to achieve an effective airway, the time required for its insertion, requirement of any manipulation, need of muscle relaxants, and presence of limb movement or bucking.,, In our study, induction with propofol–dexmedetomidine (Group I) provided fully relaxed jaw (Grade-I) in 95% of patients as compared to only 25% patients receiving propofol–butorphanol (Group II). We assessed I-gel insertion characteristics by using indigenous ease of insertion score which was graded from 1–4 and found adequate insertion conditions with dexmedetomidine. Hui et al. assessed insertion characteristics during laryngeal mask airway (LMA) insertion and found propofol with an adjuvant (alfentanil) was superior to propofol–fentanyl combination. Gupta et al. assessed jaw relaxation and LMA insertion conditions using ketamine, fentanyl, or butorphanol added to propofol and found excellent insertion conditions in propofol–butorphanol group as compared to other adjuvants, while Amin and Mohamed in their study found dexmedetomidine–propofol provided better conditions for I-gel insertion as compared to propofol–nalbuphine (P < 0.05). Propofol has the property of blunting the upper airway reflexes and when dexmedetomidine or butorphanol were co-administered, there may be an additional inhibitory effect on the upper airway reflexes. We also found better insertion score with dexmedetomidine as an adjuvant to propofol thus masking the sympathoadrenal response to I-gel insertion as compared to butorphanol. In our study there was no significant difference between requirement of the induction doses in patients receiving dexmedetomidine (108.5 ± 14.96) and butorphanol (113.8 ± 20.6). However, 21 patients in butorphanol group required additional doses of propofol which was highly significant statistically as compared to three patients in dexmedetomidine group (P < 0.001). This might be due to better sedative and analgesic effects of dexmedetomidine following activation of α2b adrenoreceptors at the level of dorsal horn of spinal cord and inhibition of substance P release. SAD cause less hemodynamic changes during insertion as compared to endotracheal intubation. Moreover, I-gel causes less hemodynamic changes as compared to other SGA devices due to composition of soft thermoplastic elastomer which causes less stimulatory effect on the airway. Propofol potentiates the decrease in HR when co-administered with Dexmedetomidine which also causes bradycardia because of stimulation of presynaptic α2 adrenoceptors leading to decreased release of norepinephrine. Amin and Mohamed found that MAP and HR were increased significantly in propofol–nalbuphine group at 1, 5, and 10 min after insertion of I-gel as compared to the hemodynamically stable parameters in propofol–dexmedetomidine group (P < 0.05). Jang et al. designed a study to assess effects of dexmedetomidine on propofol for insertion of I-gel without muscle relaxant and found that the MAP was lower (<80% of the baseline) and the incidence of bradycardia (<80% of the baseline) was higher in dexmedetomidine than in the control group (P = 0.001). In our study, dexmedetomidine group (I) showed a significant fall in HR and MAP from baseline following insertion of I-gel upto 15 min (P < 0.05), while in the burorphanol group (II), there were no changes in HR while MAP showed a significant fall (P < 0.05) only upto 2 min of device insertion. This is attributed to the action of dexmedetomidine on post-synaptic receptors and activation of α2 adrenoreceptors in central nervous system which inhibits sympathetic activity and thus decreases BP and HR. Dexmedetomidine and butorphanol both cause sedation and we found that patients receiving dexmedetomidine were more sedated but arousable and cooperative at the time of arrival in the post-anesthesia care unit. This was because of potent α2 agonist activity of dexmedetomidine and stimulation of α2 adrenoceptors in locus coeruleus causing analgesia and sedation. From the present study it was concluded that addition of dexmedetomidine to propofol provides superior insertion conditions and good jaw relaxation for ease of insertion of I-gel in first attempt. It also provides better hemodynamic responses with minimal or no intraoperative and postoperative complications along with smooth recovery as compared to propofol–butorphanol. Measurement of the oropharyngeal airway leak pressure by I-gel was not done in our study either by auscultation method or by manometer device. Secondly, our sample size was limited and larger number of patients are required for validating easy and smooth insertion of I-gel. Elgebaly AS, Eldabaa AA. Is I-gel airway a better option to endotracheal tube airway for sevoflurane anesthesia during cardiac surgery?. Anesth Essays Res 2014;8:216-22. Helmy AM, Atef HM, El-Taher EM, Henidak AM. Comparative study between I-gel, a new supraglottic airway device, and classical laryngeal mask airway in anesthetized spontaneously ventilated patients. Saudi J Anaesth 2010;4:131-6. Gibbison B, Cook TM, Seller C. Case series: Protection from aspiration and failure of protection from aspiration with the i-gel airway. Br J Anaesth 2008;100:415-7. Joshi NA, Baird M, Cook TM. Use of an i-gel for airway rescue. Anaesthesia 2008;63:1020-1. Nerurkar AA, Shaikh W, Tendolkar BA. Propofol requirement for insertion of I-Gel versus laryngeal mask airway: A comparative dose finding study using Dixon's up and down method. J Anaesthesiol Clin Pharmacol 2015;31:324-8. Brimacombe J, Berry A. The laryngeal mask airway: Anatomical and physiological implications. Acta Anaesthesiol Scand 1996;40:201-9. Scanlon P, Carey M, Power M, Kirby F. Patient response to laryngeal mask insertion after induction of anaesthesia with propofol or thiopentone. Can J Anaesth 1993;40:816-8. Cho SA, Sung TY, Cho CK, Jee YS, Kang PS. Optimal propofol dosage for I-gel insertion in healthy paralyzed patients. Korean J Anaesthesiol 2018;71:22-9. Uzumcugil F, Canbay O, Celebi N, Karagoz AH, Ozgen S. Comparison of dexmedetomidine-propofol vs. fentanyl-propofol for laryngeal mask insertion. Eur J Anaesthesiol 2008;25:675-80. Wong TH, Critchley LA, Lee A, Khaw KS, Ngan Kee WD, Gin T. Fentanyl dosage and timing when inserting the laryngeal mask airway. Anaesth Intensive Care 2010;38:55-64. Rathmell JP, Rosow CE. Intravenous sedatives and hypnotics. In: Flood P, Rathmell JP, Shafer S, editors. Stoelting's Pharmacology and Physiology in Anesthetic Practice 5th ed. Philadelphia: Wolters Kluwer; 2015. p. 160-8. Gertler R, Brown HC, Mitchell DH, Silvius EN. Dexmedetomidine a novel sedative- analgesic agent. Proc Bayl Univ Med Cent 2001;14:13-21. Cummings K, Naguib MA. Opioid agonists and antagonists. In: Flood P, Rathmell JP, Shafer S, editors. Stoelting's Pharmacology and Physiology in Anesthetic Practice 5th ed. Philadelphia: Wolters Kluwer; 2015. p. 242-3. Fukuda K. Opioid analgesics. Miller's anesthesia. In: Miller RD, Cohen NH, editors. Miller's Anesthesia, 8th ed. Philadelphia: Elsevier Saunders; 2015. p. 904. Muzi M, Robinson BJ, Ebert TJ, O'Brien TJ. Induction of anaesthesia and tracheal intubation with sevoflurane in adults. Anaesthesiology 1996;85:536-43. I-gel User –Guide. Available from: http/www.i-gel.com/lib/docs/userguides/igel-user-guide-english.pdf. [Last accessed on 2011 Nov 29]. Ramsay MA, Savege TM, Simpson BR, Goodwin R. Controlled sedation with alphaxalone-alphadolone. Br Med J 1974;2:656-9. Chauhan G, Nayar P, Seth A, Gupta K, Panwar M, Agrawal N. Comparison of clinical performance of the I-gel with LMA Proseal. J Anaesthesiol Clin Pharmacol 2013;29:56-60. Lund I, Stovener J. Dose responses curves for tubocurarine, alcuronium and pancuronium. Acta Anaesthesiol Scand 1970;37:238-42. Chari P, Ghai B. Comparison of butorphanol-thiopentone versus fentanyl-thiopentone for LMA insertion. J Clin Anaesth 2006;18:8-11. Hui JK, Critchley LA, Karmakar MK, Lam PK. Co-administration of alfentanil-propofol improves laryngeal mask airway insertion compared to fentanyl-propofol. Can J Anaesth 2002;49:508-12. Gupta A, Kaur S, Attri JP, Saini N. Comparative evaluation of ketamine-propofol, fentanyl-propofol and butorphanol-propofol on haemodynamics and laryngeal mask airway insertion conditions. J Anaesthesiol Clin Pharmacol 2011;27:74-8. Amin SM, Mohamed RM. Optimizing the condition for I-Gel insertion: Dexmedetomidine versus Nalbuphine. A double blind randomized study. Al-Azhar Assiut Med J 2014;12:272-89. Jindal P, Rizvi A, Sharma JP. Is I-Gel a new revolution among supraglottic airway devices ? A Comparative evaluation. Middle East J Anaesthesia 2009;20:53-58. Jang YE, Kim YC, Yoon HK, Jeon YT, Hwang JW, Kim E, et al. 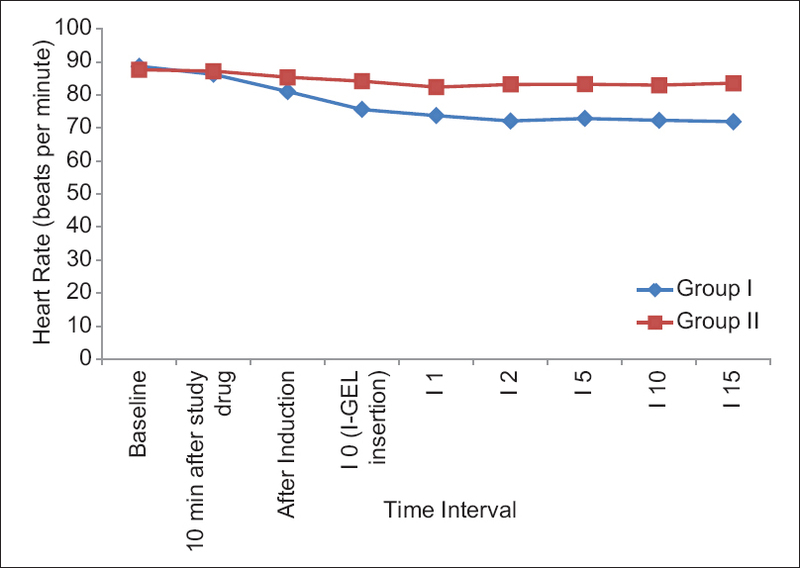 Arandomized controlled trial of the effect of preoperative dexmedetomidine on the half maximal effect concentration of propofol for successful i-gel insertion without muscle relaxants. J Anesth 2015;29:338-45. Kannaujia A, Shrivastava U, Saraswat N, Mishra A, Kumar A, Saxena SA. Preliminary study of I-Gel: A new supraglottic airway device. Indian J Anaesth 2009;5352-6. Jadhav PA, Dalvi NP, Tendolkar BA. I-Gel versus laryngeal mask airway- proseal. comparison of two supraglottic airway devices in short surgical procedure. J Anaesthesiol Clin Pharmacol 2015;31:221-5. McHardy FE, Chung F. Postoperative sore throat: Cause, prevention and Treatment. Anaesthesia 1999;54:444-53. Michalek P, Donaldson W, Vobrubova E, Hakl M. Complications associated with the use of supraglottic airway devices in perioperative medicine. Biomed Res Int 2015;2015:746560.